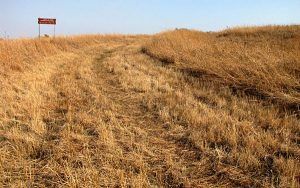 19th Century Kansas Trails. Click to see large map at Kansas Department of Transportation. Kansas probably has more frontier trails than any other state, being the jumping off point during westward expansion. In addition to the emigrant trails to the west, including the Oregon, California, and Santa Fe Trails, the Sunflower State also provided a number of military trails which connected the many Old West Forts in the state, as well as cattle trails, such as The Chisholm Trail and the Dodge City and Ellsworth Cattle Trails. Old stage routes include the Smoky Hill Trail and the Cannon Ball Stage Coach Road. Along with these, there are several old explorer routes including that of Lewis & Clark, Zebulon Pike, and Nathanial Boone. Beyond the Old West, a short peek of Route 66 can also be seen in Kansas. Get off I-70 and enjoy the history of Kansas‘ many old trails, and explore historic forts, old stagecoach stations, ghost towns, and a lot more along the way. © Kathy Weiser/Legends of Kansas, updated November 2018.